So, your patient needs a transfusion. Is it ok to reflexively order premedication to prevent transfusion reactions? Dr. Heidi Shafi explains why it might not help, and could potentially hurt! Dr. Heidi Shafi from Kaiser Permanente Los Angeles joins Dr. Chaffin to discuss premedication before transfusion. Many, many clinicians routinely order premedication of their patients with acetaminophen (tylenol) and diphenhydramine (benadryl) prior to transfusion. The idea, which seems totally logical, is that the acetaminophen might prevent benign fevers and the antihistamine might prevent benign allergic reactions (both reactions are considered “nuisances,” but as mentioned in other podcasts, episode 39 and episode 24, they aren’t always so “benign”). This practice is not new, and it has, in some cases, been incorporated into “standard” blood order sets used as a part of computerized physician order entry (CPOE) in electronic medical records/ordering systems. So, if this is pretty common, it must be the right thing to do, correct? Maybe not! Dr. Shafi takes us through the data (which is pretty extensive) describing the use of premedication, even answering the “who cares?” question that many have raised! DISCLAIMER: The opinions expressed on this episode are those of my guest and I alone, and do not reflect those of the organizations with which either of us is affiliated. Neither Dr. Shafi nor I have any relevant financial disclosures. The images below are generously provided by Dr. Shafi. Fry JL, Arnold DM, Clase CM, et al. 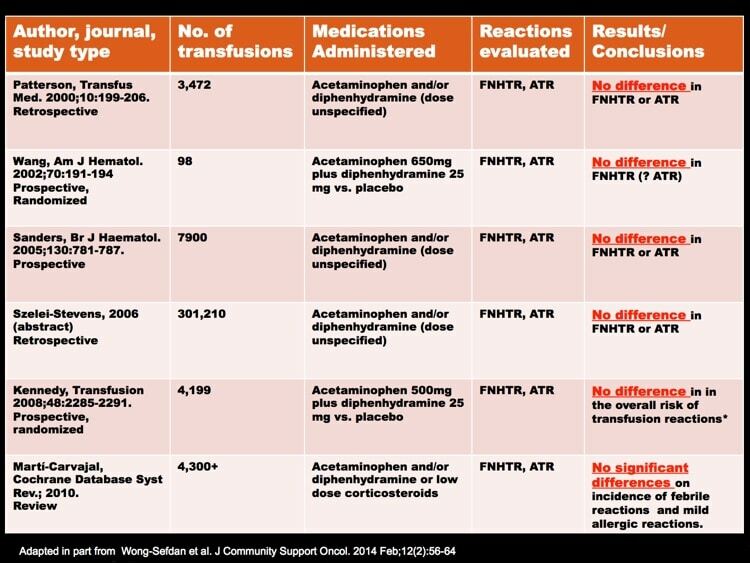 Transfusion premedication to prevent acute transfusion reactions: a retrospective observational study to assess current practices. Transfusion 2010;50:1722-1730. Kennedy LD, Case LD, Hurd DD, Cruz JM, Pomper GJ. A prospective, randomized, double-blind controlled trial of acetaminophen and diphenhydramine pretransfusion medication versus placebo for the prevention of transfusion reactions. Transfusion 2008;48:2285-2291. Wang SE, Lara PN Jr., Lee-Ow A, et al. Acetaminophen and diphenhydramine as premedication for platelet transfusions: a prospective randomized double-blind placebo-controlled trial. Am J Hematol 2002;70:191-194. Sanders RP, Maddirala SD, Geiger TL, et al. Premedication with acetaminophen or diphenhydramine for transfusion with leucoreduced blood products in children. Br J Haematol 2005;130:781-787. Patterson BJ, Freedman J, Blanchette V, et al. 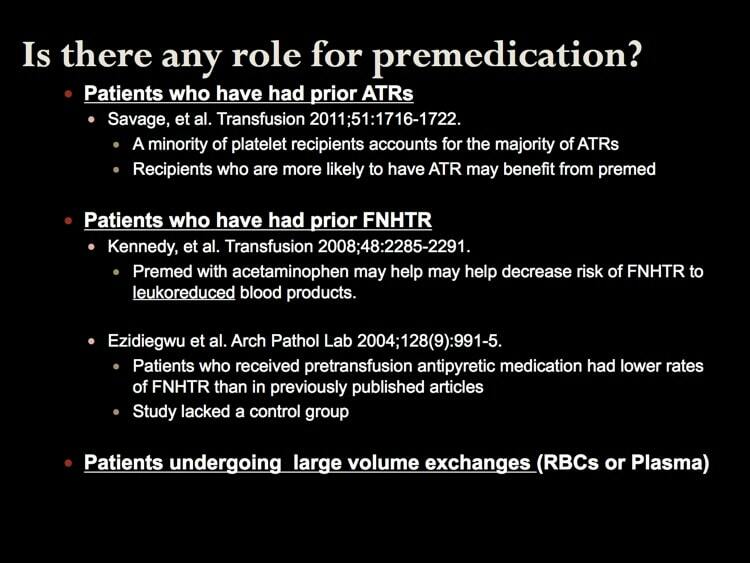 Effect of premedication guidelines and leukoreduction on the rate of febrile nonhaemolytic platelet transfusion reactions. Transfus Med 2000;10:199-206. 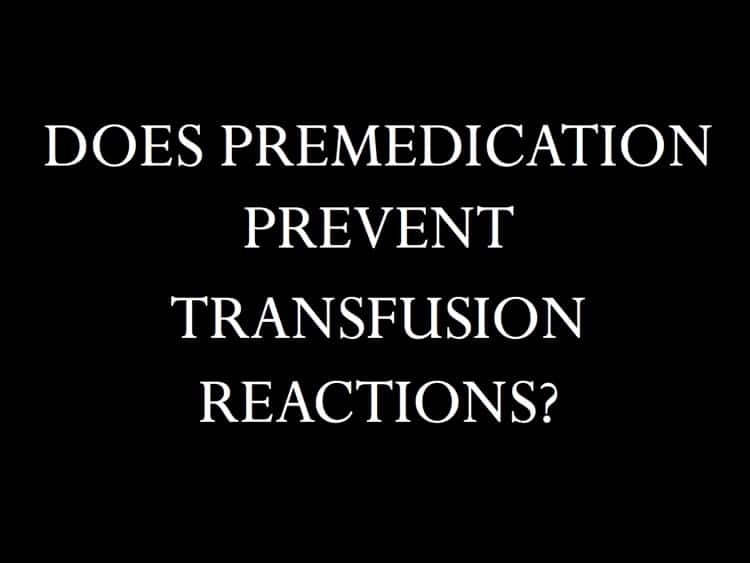 Szelei-Stevens KA NA, Al-Sammak M. Transfusion reactions: to premedicate or not to premedicate? In: Transfusion. Abstracts of Papers to be presented at the 59th AABB Annual Meeting and TXPO. October 21-24, 2006. Miami Beach, Florida; 2006:95A. Savage WJ, Tobian AA, Fuller AK, Wood RA, King KE, Ness PM. Allergic transfusion reactions to platelets are associated more with recipient and donor factors than with product attributes. Transfusion 2011;51:1716-1722. Cohn CS, Stubbs J, Schwartz J, Francis R, Goss C, Cushing M, Shaz B, Mair D, Brantigan B, Heaton WA. 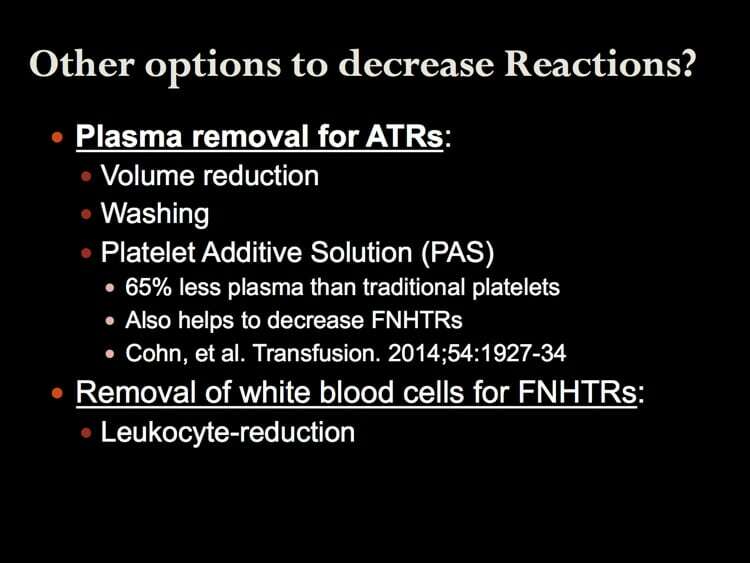 A comparison of adverse reaction rates for PAS C versus plasma platelet units. Transfusion. 2014;54:1927-34. Martí-Carvajal AJ, Solà I, González LE, Leon de Gonzalez G, Rodriguez-Malagon N. Pharmacological interventions for the prevention of allergic and febrile non-haemolytic transfusion reactions. Cochrane Database Syst Rev. 2010. Ezidiegwu CN, Lauenstein KJ, Rosales LG, Kelly KC, Henry JB. 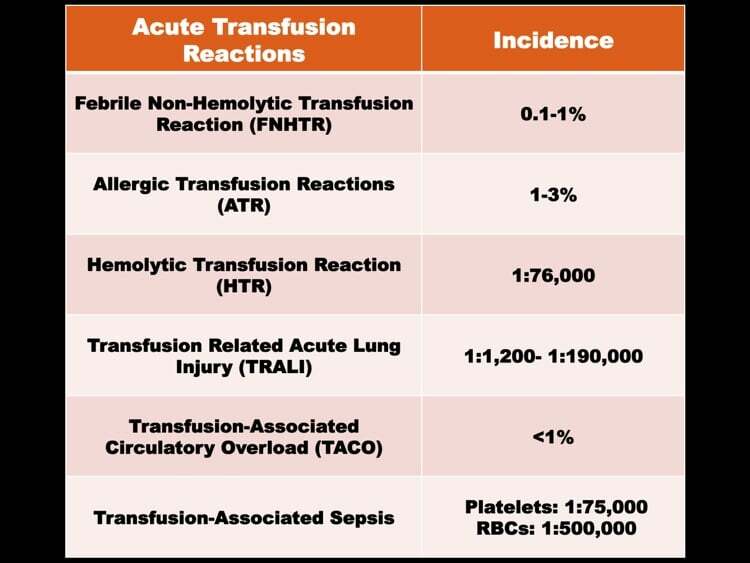 Febrile nonhemolytic transfusion reactions. Management by premedication and cost implications in adult patients. Arch Pathol Lab Med. 2004 Sep;128(9):991-5. Tobian AA, King KE, Ness PM. 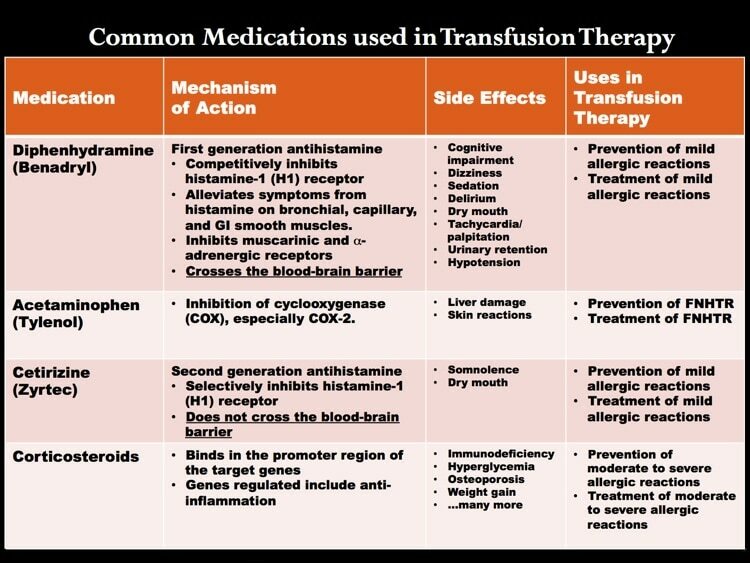 Transfusion premedications: a growing practice not based on evidence. Transfusion. 2007;47:1089-96. This was really helpful. I am going to share this with my colleagues at our infusion center. Glad you enjoyed it, Lori! Dr. Shafi is awesome, and I am happy that this info is useful to you and your fellow nurses.